Dates: April 27 – May 7, 2018. Arriving in Port of Spain late the night before did not hamper our small band of intrepid travelers as we set out early for our first full day of birding. Within moments of leaving the hotel, touring the nearby wetlands and greenspaces, we were treated to wonderful sightings of Saffron Finches, Little Blue & Tricolored Herons, Snowy & Little Egrets, and a host of other species, including the ubiquitous Palm Tanager, the Blue-gray Tanager, and the difficult-to-locate Moriche Oriole. 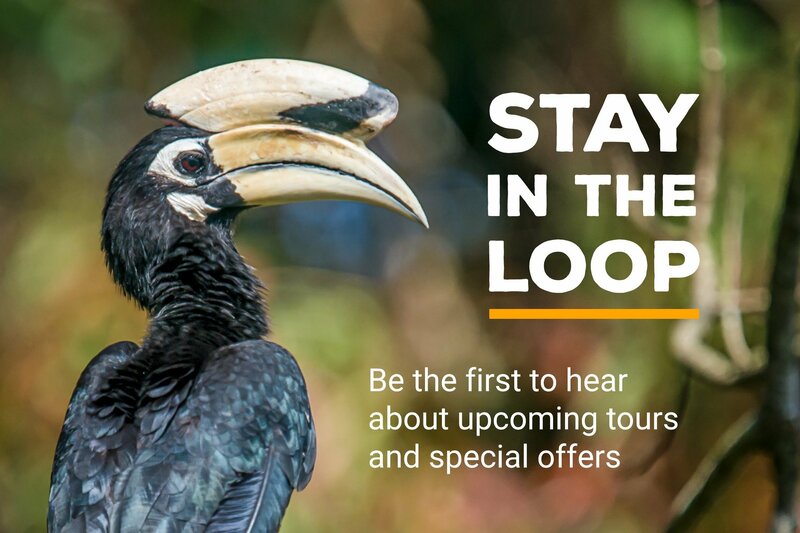 Trinidad’s rich avian diversity – it claims more species than any other island in the Caribbean-comes as no surprise. Trinidad’s latitude is ~11º North of the Equator, placing it well within the tropical zone, and it is still a lush and verdant environ, where seemingly anything can grow if you were to just drop a seed. As a region’s avian diversity is largely a function of its botanical diversity, thus it was that every little pond or park yielded a multitude of bird species. Before our first morning was done, we stopped at a small sewage treatment plant where swarms of Yellow-hooded Blackbirds loudly made themselves known, and both the Common Moorhen and Purple Gallinule paraded the pond, winding their way through the largest number of Wattled Jacanas I have ever seen in one place. But our morning’s luck was not really luck: it was due to the experience of our local co-leader, Mr. Lester. Lester is an avid birder, whose family has for decades, played a lead role in Trinidad’s bird and habitat conservation. 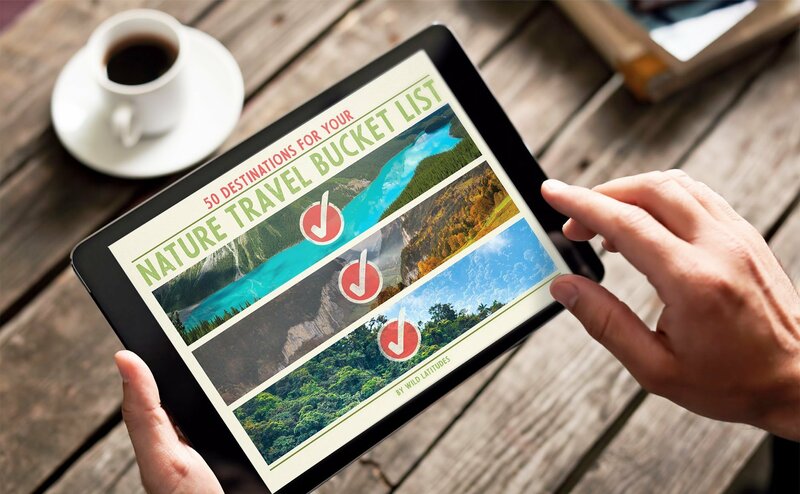 They now operate tours into the Coroni Swamps, Trinidad’s premiere birding location, and an area Lester’s father worked to protect via government legislation. After a full morning of birding, we headed for the San Pablo Hummingbird retreat, a small, urban setting in Valencia. We had a delicious meal prepared by Mr. & Mrs. Alfonso, the proprietors of the retreat, while we sat watching Ruby-topaz Hummingbirds, Copper-rumped Hummingbirds and Blue-chinned Sapphires, as they buzzed by our heads, endlessly defending their feeders from one another. We pulled ourselves away from this lovely little oasis, only because we knew another awaited us. We made our way up a windy road, through the foothills, finally arriving at the world-famous Asa Wright Nature Center. We quickly checked in and re-united on the veranda, which overlooked a variety of birdfeeders and the valley beyond… This is one of those almost legendary birding destinations, where one can bird to their heart’s content, relaxing comfortably while sipping a favorite beverage. 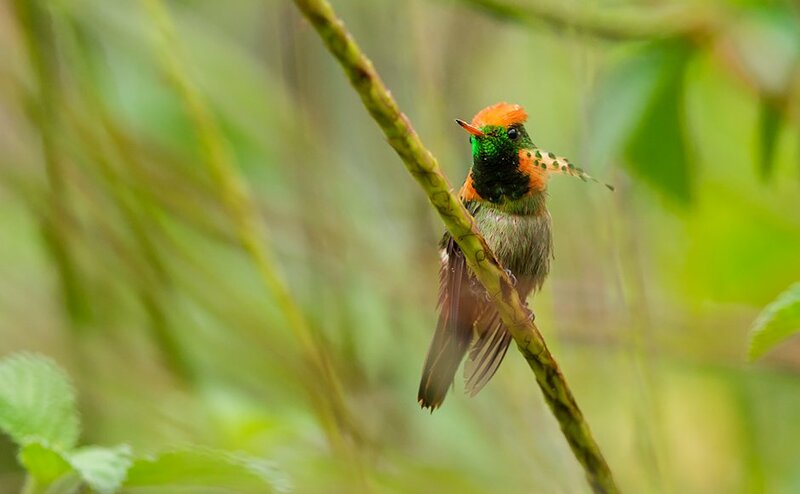 And for the next couple of hours, that is just what we did, adding the Tufted Coquette, Black-throated Mango, White-chested Emerald, Purple Honeycreeper, White-shouldered, Silver-beaked & Turquoise Tanagers to our lists, just to name a few. Our first day in Trinidad was filled with the sights, sounds, tastes and smells of a country that is unique unto itself…a Caribbean island bestowed with natural resources, home to a wonderfully diverse people, and the best part was, we all knew our journey had only just begun. Tufted Coquette Hummingbird. Photo by Faraaz Abdool. Our second full day of the trip was spent hiking and birding the extensive trails of Asa Wright, and these famous grounds did not disappoint! Along with wonderful sightings of birds already seen, we added the lovely little White-bearded & Golden-headed Manakins to our list, as well as the unusual Bearded Bellbird, a regional specialty used in the logo by Asa Wright. Before the day was done, we added the Guianan (Violaceus) & Green-backed Trogons, Ocher-bellied Flycatcher, Southern Beardless Tryannulet, Boat-billed Flycatcher, Streaked Xenops, and Blue Dacnis to our lists, along with many others. It was a delightful day to be sure, made more so by the beautiful setting, superb meals, and kind, welcoming staff of the Nature Center. The next day, we ventured North on Blanchisseuse Road, birding our way along, stopping numerous times when the habitat looked especially promising. 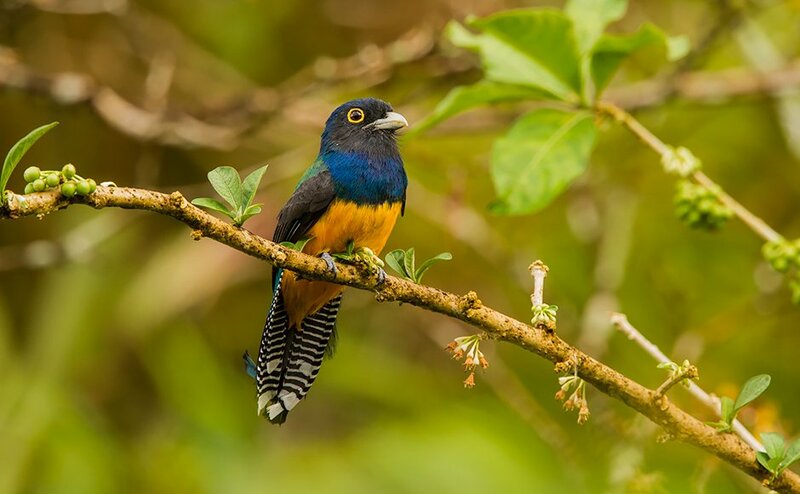 Of special note this day was the Short-tailed Hawk soaring overhead, and a grove filled with several pairs of nesting pairs of Guianan Trogon’s. We stopped at the village of Brasso Seco for lunch, then visited a small chocolate shop at the Community Center where all the chocolate is made by hand from local ingredients. At the time of our visit, the shop was staffed by a young woman named Kelly who was happy to demonstrate the process of turning raw coco into tasty treats. Needless to say, we all left with several chocolate bars in hand. It was a real pleasure to experience and support such a wonderfully organic community-run endeavor. Guianan Trogon. Photo by Faraaz Abdool. The last morning at Asa Wright we set off early to see perhaps its most notable resident, the Oilbird. After about a half-hours walk through a forest that felt both primary and primeval, we headed down into a ravine; a crack in the Earth carved away further by the ever-present stream flowing into it. Our guide from Asa Wight knows this to be Guacharo Gorge, the location of Dunston Cave, where the Oilbirds dwell. This unusual species is the only known nocturnal, fruit-eating bird in the world, yet its strangeness does not end there. It spends the days roosting in dark, forbidding caves, and it hisses and clicks and cries if anyone approaches, sounding all the world like some demonic spectral of another world (thus its local name “ Diablotin,” or “Devil Bird”). We do our best not to disturb these birds, creeping up slowly and quietly, a few at a time, going no farther than the mouth of the cave where we hope to catch a glimpse of the Oilbirds roosting on small ledges inside the cave. And sure enough, they are there, looking all the world like an odd member of the night-hawk family, or perhaps a nightjar. And this makes sense, because even though the Oilbird is the sole species in its family (Steatornithidae), it is thought to have evolved from the family for which night-hawks and the like belong (Caprimulgidae). The Oilbirds get their name from the fact that their chicks are so full of fat, they were gathered by the indigenous Chaime people who rendered them down for their oil to light their torches. Though this activity is no longer practiced, hunting of the Oilbird is still a threat. Though the Oilbird population on Trinidad is seemingly stable, the number is still relatively low, so the species still requires protection. We hiked back through the forest to the Nature Center, enjoying one last stroll beneath the canopy of the rainforest. We sadly said our goodbyes to our gracious hosts of Asa Wright, loaded our vans and headed to our next destination, the far NE coast of the island. We arrived at the Mt Plaisir Estate Hotel in Grand River well before dark, giving us plenty time to relax and enjoy the stunning beach directly in front of the hotel. It is largely for this beach that we have come, for it is considered the number one location in the western hemisphere to view a creature of mythic lore: the Leatherback Sea Turtle. These massive creatures use the beaches of Northern Trinidad as one of their primary nesting grounds, laying up to 100 eggs at a time under the cover of darkness. This is what we have come here to see, and the Leatherback proved themselves worthy of our journey. Reaching a weight of over 2,000lbs, the Leatherback is by far the largest living sea turtle. It travels the world’s oceans in search of its prey, jellyfish, (or “jellies” as they are now referred), covering a distance of over 6,000 on its annual migration to/from its feeding grounds. A full grown Leatherback can consume several hundred pounds of jellies a day, and it needs this fuel to drive it’s unique metabolic system. The Leatherback has a complex system of counter current exchanges throughout its body, as well as an ability to generate metabolic heat. Together, these adaptions allow the Leatherback to function as an endothermic (warm-blooded) organism, even while traversing some of the coldest oceans in the world. This is a rare and amazing feat for a reptile. But it has had eons to evolve: this species can trace its evolutionary roots back to the Cretaceous Period, over 110 million years ago. We were all eager to catch a glimpse of theses prehistoric leviathans, and as nightfall would soon be upon us, we knew we didn’t have long to wait. After dinner, we all walked over to the nearby Turtle Education Center so that we could pay our turtle conservation fee and receive training on the proper etiquette one is required to use when viewing the Leatherback. We then we introduced to our local turtle guide who was equipped with a special red-lens flashlight that is proven not to disturb the nesting sea turtles, and then followed him out onto the beach in hopes of encountering a Leatherback. Within moments it was obvious this would not be difficult: Leatherbacks were everywhere! Some were already digging their nests, some were already in a “trance” and laying their eggs, others were searching for a nest site, and still others were just coming out of the sea. It was stunning. And enchanting. Our guide led us to a turtle that was digging it’s nest, and we watched for a half an hour as, using its hind fins, it dug deeper and deeper into the sand. Pausing only to catch it’s breathe, the turtle was relentless in its task. Finally, when it could dig no deeper, quite suddenly she started laying her eggs, each drooping in the center of the pit she had just dug. Most were large and obviously fully developed, but others were small and looked as though they had not been fertilized. Still, our turtle laid well over 50 good eggs before she diligently coved her clutch back up with sand. Then she did a strange thing… she walked around and around over her newly-filled nest, throwing sand this way and that. It became clear what the guide said was true: she was camouflaging the location of her nest. She was a good Mom, at least for the moment. After satisfied she had done her job, she headed back to the sea, leaving her offspring each to its own fate. And the possibilities are many. Though an adult Leatherback has few, if any, natural predators, the young are not so lucky. When they hatch, they have to evade a gauntlet of predators: raptors, gulls, dogs & cats; then once in the ocean, the young turtles must evade every fish large enough to eat them, which is most of them. 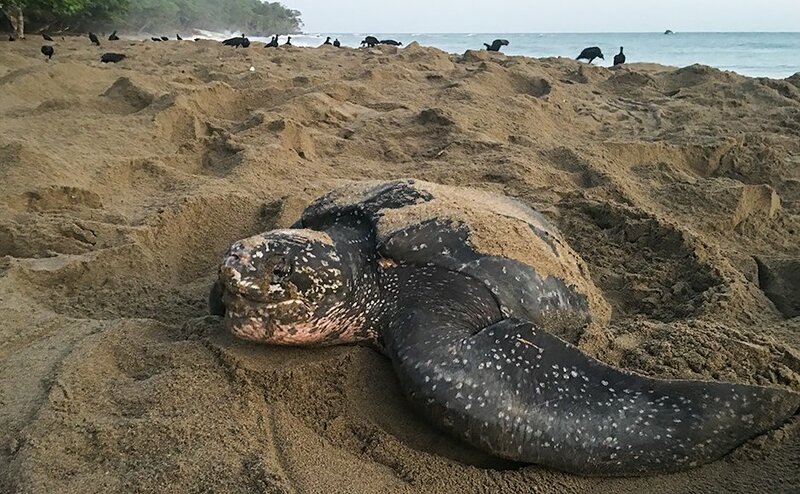 If fortunate, a single hatchling will survive each clutch to adulthood; but this is enough for the species to survive, as each female Leatherback lays several clutches of eggs every year. What I loved most about our experience in Grand River, was how the entire community was seemingly working to ensure the survival of the Leatherback. And this make sense, because by doing so, the community is ensuring their its survival as well. More and more people are coming to Grand River to see these ancient sea turtles, so it is, that modern Ecotourism is bringing with it a new hope for the survival of both the Leatherback, and the village of Grand River. After a long night of waiting sea turtles, one might think we would sleep in… but not so! Another sought after species awaited us, the endemic Trinidadian Piping Guan, and the best time to see it was right at sunrise. The owner of the hotel, Piero, was kind enough to get up before sunrise and make coffee for our crew, we gratefully slurped this up then set out on our quest. Sure enough, only a mile or so away, another kind gentleman had a place set up to see the Guan as the birds arose to feed in the trees. Once again, we were blessed with perfect views of a species we were hoping to see. These large birds are amazingly secretive for their size (about that of a chicken), yet they are also comically clumsy when feeding, making quite a racquet as flop about in the trees. We departed Grand River with a new destination in our sights, the island of Tobago. This charming little island is known for it laid back, Caribbean vibe, and it truly does have that feel. Where Trinidad is fast-moving, go-go-go, Tobago is slow-slow-slow, which I think I can say, suited the group just fine. We caught a mid-day flight to the island, then drove all the way across the island to wonderful hotel right on the beach called the Blue Waters Inn (BWI). This was our base of operations for the next three days and nights of our trip, and what a perfect place to relax between outings. From here we birded the Main Ridge forest, picking up such species as White-tailed Sabrewing, Collared Trogon, red-rumped Woodpecker, Trinidad Motmot, Red-eyed Vireo, Stripe-breasted Spinetail, Giant Cowbird, and the endearing Blue-backed Manakin. We also had our best looks at the Rufous-tailed Jacamar, a very cool bird. 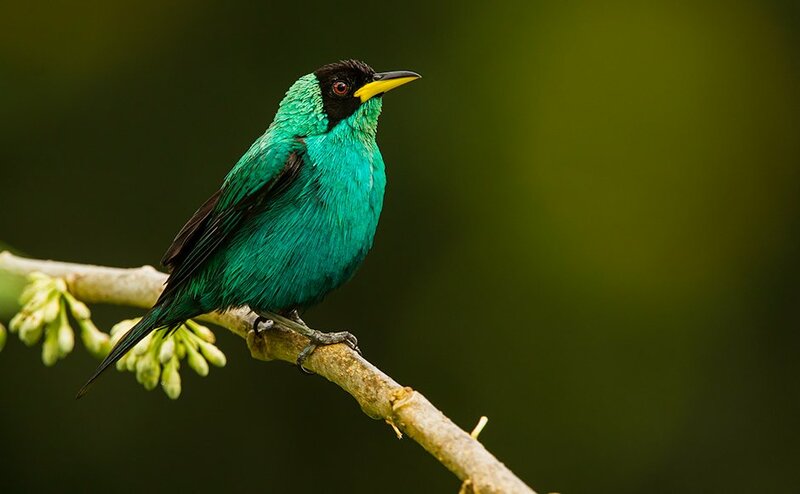 Green Honeycreeper. Photo by Faraaz Abdool. We also took a boat out to the tiny island called Little Tobago, where we hiked to the top to see Red-billed Tropicbirds, adding Brown Noody, and good looks at Bridled & Roseate Terns along the way. We stopped to snorkel a coral reef on the way back to the hotel, rounding off another magical morning in Tobago. Back at BWI, the ever present Rufous-vented Chachalaca kept us company during lunch, as did the turquoise-blue waters of the Caribbean. After three glorious days on Tobago, we headed back to Trinidad and one final birding extravaganza: the Caroni Swamp National Park. Lester arranged a private boat for our group, allowing us to linger where we liked, and another Trinidadian friend and ace photographer joined us for the tour, Faraaz Abdool. The beauty of the swamps cannot be over-stated, nor can the splendor of it birds. Best known for the stunning Scarlet Ibis, this is but one of many species utilizing and thriving in the swamps. All manner of water birds may be seen here, but new to our list were the White-cheeked Pintail, American Flamingo, Least Grebe, Western Sandpiper, Large-billed Tern and Semipalmated Sandpiper. We also added Tropical Screech Owl, Lesser Nighthawk and even a Silky Anteater to our lists before the tour of the swamp was done. It was an unforgettable evening for all of us. 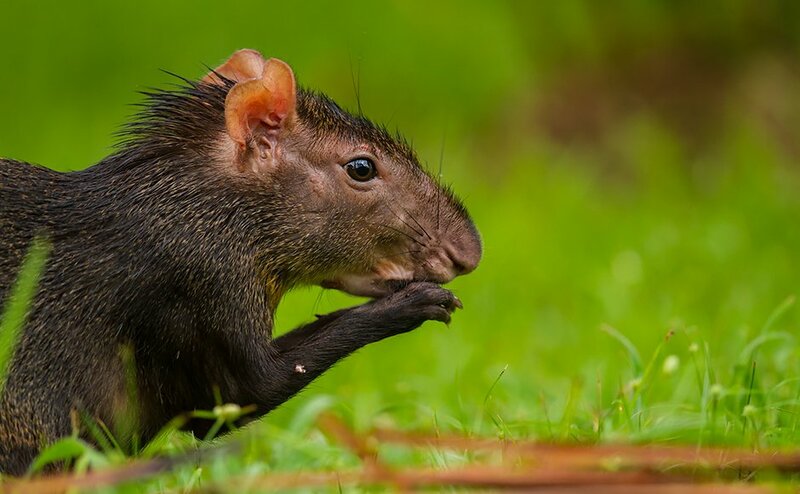 Red-rumped Agouti. Photo by Faraaz Abdool. We ended the trip in the best of ways… Lester invited us to dine at his house with his family, and it was an honor and a pleasure to do so. The food, prepared by his wife, was an amazing array of Trinidadian/East Indian cuisine. What a delicious way to say goodbye to our new friends and the country of Trinidad. I must give my special thanks to Lester, not only for helping make this trip possible, but for the warmth and special character he displayed each and every moment of the trip. 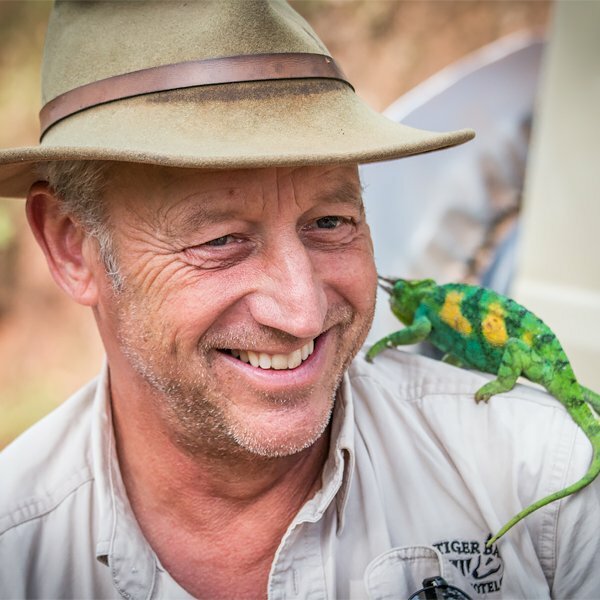 He is following in his Father’s footsteps, working hard every day to share the natural beauty of Trinidad with locals and visitors alike, and to protect these treasured resources so they may endure and be enjoyed for generations to come. Trinidad is fortunate to have Lester as one of its own.